Years ago someone tried to tell me that in order to make a mawashi geri (roundhouse kick) from the rear leg, it’s best to turn on the heel of the supporting foot. As I contemplated this concept, I wondered why someone could ever believe this could help? I could think of several reasons why this was complete nonsense. Any effective rear leg kick requires forward weight transfer. Keeping weight on the back part of the foot violates that concept. Turning on the heel shortens the range of the technique compared to turning on the ball of the foot, by 6-10 inches (depending on the size of your foot – might be more if you’re a Hobbit). Turning on the ball of the foot allows quick engagement of your toes to the ground to help you keep balance. Turning on the heel disengages your toes. Therefore more control over the technique is available when your weight is forward on the ball of the foot and toes gripping the floor, especially for recoiling the technique. It’s extremely difficult to pull the leg back when off balance and without the toes engaged. It’s also a slower technique because of the weight distribution. Remember your weight should centered over your foot and toes engaged for an explosive forward push. Consider a sprinter wanting to launch quickly – is their weight back on their heels or forward on the front part of their feet? 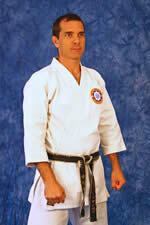 TEACHING TIP: Teach your students to ENGAGE the front part of their feet no matter if it’s basics, kata or kumite. It gives better control, balance and connection. Here’s a little experiment you can do to get your point across. Have your students put their weight on their heels and lift their feet up. Then have them attempt to run on their heels. They’ll immediately realize their weight needs to be forward over the front part of their feet, no matter if it’s running or making any forward karate technique. HOWEVER… recently I discovered ONE situation in which TURNING ON THE HEELS works better than turning on the balls of the feet. In fact when I saw people doing this, I had an “a-ha” moment. They were getting incredible results for a specific karate technique by turning on their heels.